Map of Nine of the Central States. 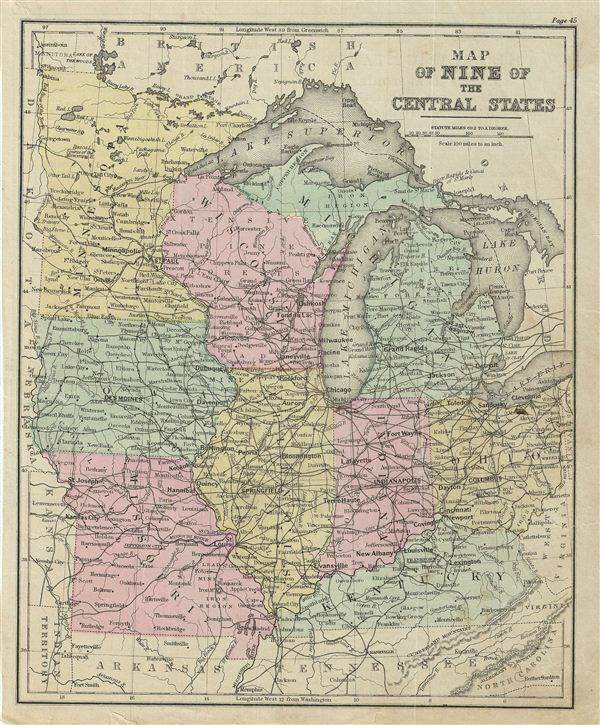 This is an example of David M. Warren's 1879 map of the nine central states of the United States. It covers Minnesota, Wisconsin, Michigan, Ohio, Kentucky, Indiana, Illinois, Iowa and Missouri. It also includes parts of the neighboring states. Four of the five Great Lakes, Lake Superior, Lake Michigan, Lake Huron, Lake erie, are also included. Oklahoma, which was at the time an Indian Reservation, is so marked. Throughout, the map identifies various railroads, cities, towns, rivers, islands, mountain passes and an assortment of additional topographical details. The map is color coded according to regional and political boundaries with elevation rendered by hachure. Issued as page 45 in the 1879 edition of Warren's Common-School Geography. Warren, D. M., Common School Geography, 1879. Very good. Even overall toning. Text on verso. Verso repair at few places near margins. Some foxing.